Heat oven to 350°F (325°F for dark pan). Grease and flour 13x9-inch pan. In 1-quart microwavable bowl, place bittersweet chocolate, butter and 1 cup of the chocolate chips. Microwave uncovered on High 1 1/2 to 2 minutes, stirring twice, until melted and smooth. Cool slightly, about 5 minutes. In large bowl, beat eggs, sugar and vanilla with electric mixer on medium speed until smooth. Add cooled chocolate mixture. Beat until well blended. Add flour, baking powder and salt. Beat on low speed until blended. By hand, stir in cookies and remaining chocolate chips. Pour into pan. Bake 35 to 40 minutes or until edges begin to pull away from sides and center is set. Do not overbake. Immediately sprinkle candy on top of hot brownies. Let stand 10 minutes or until completely softened. Pull tip of toothpick through softened candy to spread and swirl. (It won’t completely cover top). Sprinkle with cashews. Cool until set, about 1 hour. For brownies, cut into 6 rows by 6 rows. To crush cookies, place them in a resealable food-storage plastic bag; seal bag and finely crush with rolling pin or meat mallet. (Or, use food processor to crush them.) 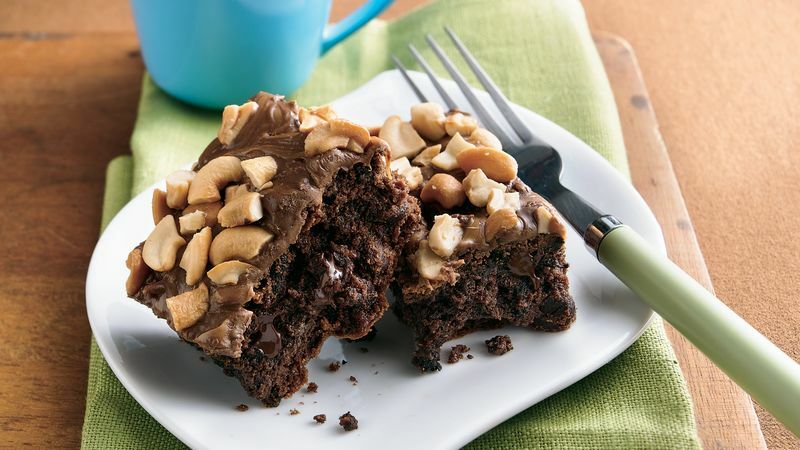 The cookies lend flavor and texture to the baked brownies but are not visible in the brownies. These are very moist fudgy brownies. They may seem soft when they come out of the oven, but when they are completely cooled, they will cut nicely. Extra special when served with a scoop of softened caramel ice cream or a dollop of sweetened whipped cream on top.